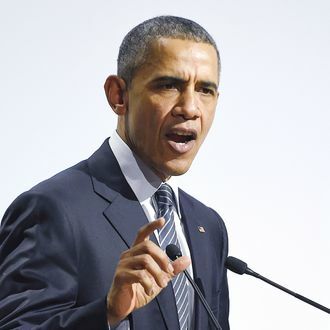 President Barack Obama speaks at the United Nations conference on climate change. That’s right: Countries that have been breaking the climate since the Industrial Revolution — and benefiting from the economic gains that resulted from massive pollution — are now deciding whether they’re willing to buy it. Plenty of leaders have signaled a desire to do so, but it’s not clear where things will end up after a week of debating how much work these investments would entail. However, a new poll from the New York Times and CBS News shows that 63 percent of Americans think the U.S. should sign an international climate agreement. The last time world leaders met en masse to try and figure out the environment — when the Kyoto Protocol was designed at the end of the ‘90s — the U.S. didn’t give the agreement a thumbs-up because of disagreements in Congress. Not only do many leaders with different politics and constituencies need to figure out how to solve environmental problems that have been simmering for decades — they also need to do it while thousands of activists and interested parties watch the proceedings and prepare to be disappointed by the fact that the agreement reached, which will be sanded down by the inevitable compromises of politics, will perhaps not be as good as anyone on the outside hoped. According to France, there are at least 150 world leaders at the event — more heads of state and important politicians than have ever been in the same place at the same time than ever before. However, the protesters congregating in Paris — and around the world — are plenty loud now without the interference of those who will write the history textbooks. Hundreds of thousands of people rallied on Sunday across the globe. Thousands of people gathered in Paris, where the government banned many planned marches, citing the state of emergency that was declared after the attacks earlier this month. Some protesters yelled “a state of emergency is a police state” at police, and more than 200 demonstrators were arrested. 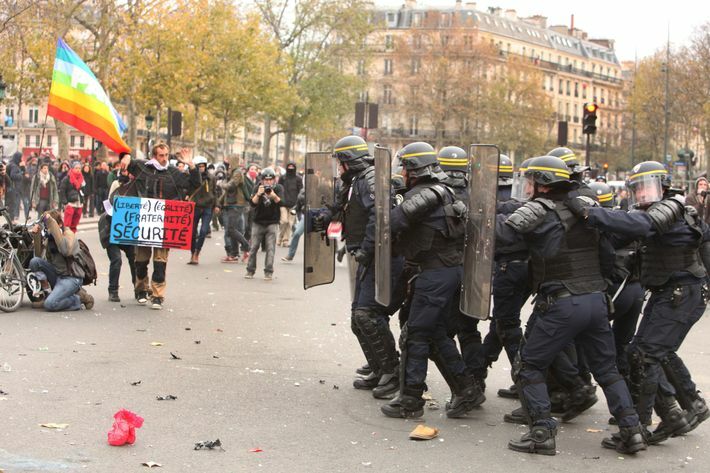 A few protesters threw bottles at law enforcement, and police eventually deployed tear gas and flash-bang grenades. The protest — which mostly entailed thousands of people forming a chain along the planned march route — was mostly peaceful. Thousands of pairs of shoes were lined up for all those who couldn’t attend the march. 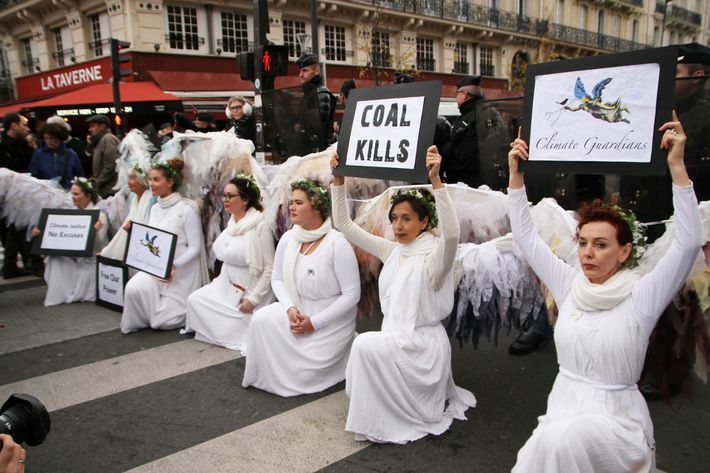 The worries caused by the Paris attacks — which left 130 people dead — have not only ended many of the climate talks’ extracurricular events; they’ve also made security very, very noticeable. Imagine what a city would look like if dozens of heads of state descended on it at the same time — and then multiply the amount of security you think that would entail by a hundred. Thousands of soldiers and police are stationed across the city. Miles of roads have been closed. Obama tried to link the talks to this month’s attacks in his Monday address. 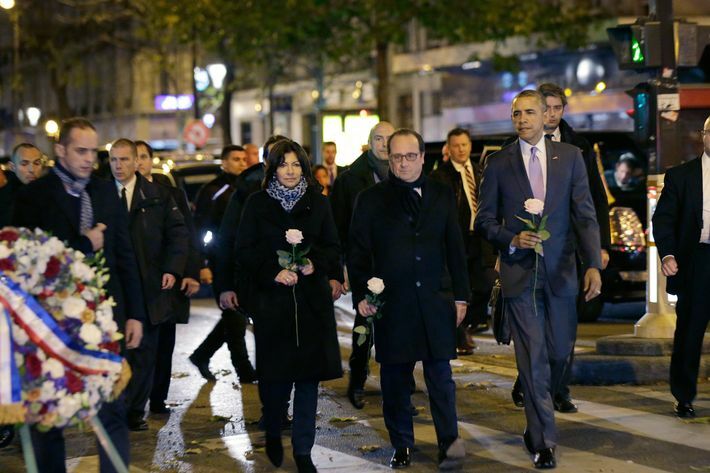 He called the conference “an act of defiance.” “What greater rejection of those who would tear down our world,” Obama said, “than marshaling our best efforts to save it.” The president visited the Bataclan — the music venue where dozens of people were killed — and dropped a single white rose at a memorial for the dead. On Monday, the leaders will mostly be giving their opening statements to the assembled crowd of very impressive and powerful people — signalling where their priorities are and how far they’d be willing to go — and holding private meetings as the final few disagreements are sorted out. Obama has already had a “World’s Worst Polluters” meeting with Chinese president Xi Jinping. Meanwhile, it is inevitable that leaders will get off topic every now and then during the week; when you have the opportunity to get dozens of heads of state in the same place, it seems likely they will have other things on their minds, especially given how messed up the world is right now. Reuters reports that Obama and Russian president Vladimir Putin — who said on Monday that “Climate change has become one of the gravest challenges that humanity is facing” — have already met to talk about Syria and Ukraine.